The N.A. Woodworth Retractable Work Driver Chuck (RWD) extends and retracts to cut your turning operations in half. 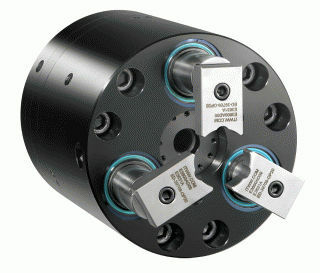 We've combined the advantages of a retractable chuck with the proven quality of ITW Workholding. The retractable jaw chuck allows for one continuously run turning operation. A major improvement over conventional chucking which requires two operations and two machines for turning a shaft. ITW Workholding can adapt the design options of the RWD to suit your application, and our full time service department is ready to back up our quality products. RWD chucks are available in 8", 10", 12", 15" and 18"